No further pollution has been detected in the area of the grounded oil rig Transocean Winner as the U.K. Maritime and Coastguard Agency (MCA) continues to monitor the scene. The MCA counter pollution surveillance aircraft yesterday flew over the location and surrounding area to make careful observations for pollution around the rig and the nearby coast and sea and no sheen or sign of pollution has been found. 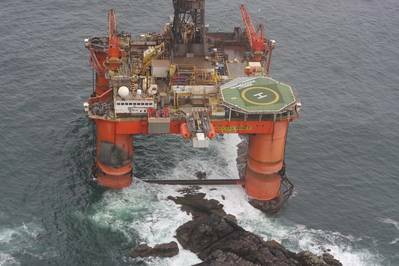 Teams from Smit Salvage and Transocean will continue inspections on board the rig this week and the rig remains in the original position. Salvors identified two of the four diesel fuel tanks on the rig appear to have been breached. It is estimated that the maximum amount of diesel which could have been lost from those tanks is 53 metric tons and salvors will determine the quantity of diesel remaining in those tanks during the course of the salvage operation. The rig broke free from a tow line in severe weather Monday and ran aground off the western isles of Scotland. Additional salvors and technical experts from Transocean and equipment continue to arrive to the incident area to support the operation. A temporary exclusion zone of 300 meters to keep boats away remains in force. The tug Union Bear remains in the vicinity along with the Emergency Towing Vessel Herakles, which is funded by the UK Government to support the operation. Hugh Shaw, the Secretary of State's representative for maritime and salvage continues to monitor the operations and is maintaining contact with all the key stakeholders including Transocean, Smit Salvage, the Scottish Environment Group and Western Isles Council.